Denver, Colorado is becoming increasingly popular as one of the best places to retire in Colorado. The affordable prices, desirable climate and abundance of cultural and recreational opportunities hold particular appeal with today s active adult homebuyers. 55+ retirees now have a handful of 55+ communities in Colorado from which to choose. Regardless of which Denver 55+ active retirement community you choose, you will find a lifestyle that is unbeatable. Most of Denver s age-restricted neighborhoods include an on-site activities director who coordinates a variety of social clubs and interest groups. Plus, you ll encounter many other buyers who are 55 and better in Denver active adult communities who share your zest for living life to the fullest. Situated in the Colorado Front Range region, Denver is located east of the Rocky Mountains and west of the High Plains. The center of Denver is mostly made up of plains while areas to the north, west, and south are hilly. Denver encompasses a total area of 155 square miles, 1.6 square miles of this is water and 153 square miles is land. 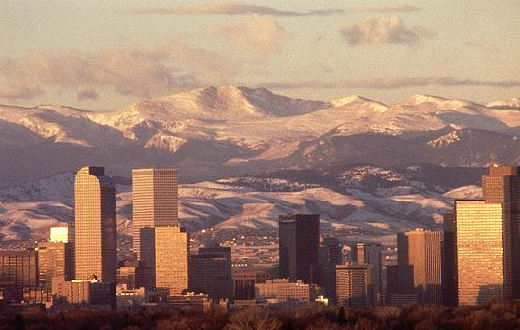 Denver earned its nickname the Mile-High City because its elevation is one mile above sea level. There are 78 official neighborhoods that include everything from skyscrapers to late 19th Century developments. In terms of climate, Denver sees about 13 inches of rain per year, less than the national average. While the US average snowfall is 36.5 inches per year, the Denver area sees about 54 inches of annual snowfall. There are about 245 sunny days per year in Denver compared to national average of 205 days. The comfort index in Denver is higher than the national average and the average high temperature in July is about 86 degrees while in January the low is 22 degrees. Denver enjoys a relatively low humidity level, making for beautiful days and comfortable evenings. Active adult communities in Denver are located in an outdoor adventurer's paradise. There are dozens of bike trails, golf courses, ski resorts, and city parks. Even though it s a world-class city you ll find over 4,000 acres of parks that include 300 acres of rivers and trails and 14,000 acres of mountain parks. Some popular parks include City Park, Cheesman Park, Washington Park, Civic Center Park, Confluence Park, Skyline Park, Centennial Flower Gardens, and Sloan s Lake Park. Throughout the state of Colorado there are more than 200 golf courses. Green Valley Ranch Club, Fossil Trace Golf Club, Arrowhead Golf Club, The Ridge at Castle Pines North, Riverdale Dunes Golf Course, The Club at Bear Dance, and Broadmoor Golf Club are just a few of the beautiful courses near the Denver area. Residents of 55+ communities in Denver can take daytrips to hit some of the best slopes in the nation. These include Winter Park Resort, the Loveland Ski Area, Arapahoe Basin Ski & Snowboard Area, Eldora Mountain Resort, and the Rocky Mountain National Park. Sports enthusiasts will enjoy rooting for Denver s professional teams that include the Colorado Rockies, Denver Broncos, Denver Nuggets, and Colorado Avalanche. With thrilling amusement parks, captivating museums, exhilarating nightlife, popular restaurants, and a vibrant art scene, Denver offers something for everyone. Colorado is one of the fastest growing states in the nation that has had a population growth of over 17% since 2000 with just over 5 million residents. Overall, the cost of living is 8% higher than the national average but the average local taxes are consumer-friendly with an average tax burden of 9.02% while the national tax burden sits higher at 10%. Colorado does not tax Social Security as well as pension income up to $20,000 for retirees under the age of 65 nor the first $24,000 for those aged 65-plus. Residents of 55+ communities in Colorado are some of the healthiest in the nation and have the second lowest obesity rate in the nation at 20.4%. Active adult communities in the Denver area are close to many medical centers. There are 33 hospitals, nine of which are top ranking. The University of Colorado Hospital in Aurora is in the highest ranks and Craig Hospital, Porter Adventist Hospital, Medical Center of Aurora, St. Luke s Medical Center, Denver Health Medical Center, Rose Medical Center, Sky Ridge Medical Center, and Littleton Adventist Hospital are high-performing as well.